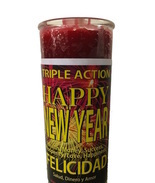 ​Purchase your "New Year's 2016" wish candle TODAY...! For more info on purchasing and details, click on the candle. Purchase your New Year's 2016 wish candle. Comes prepared with oils for new beginning's, health, career, relationships, money and protection. When lighting candle, make your 10 wishes. Must purchase no later than December 27, in order to receive your package on time. To order candle, call or email ONLY.